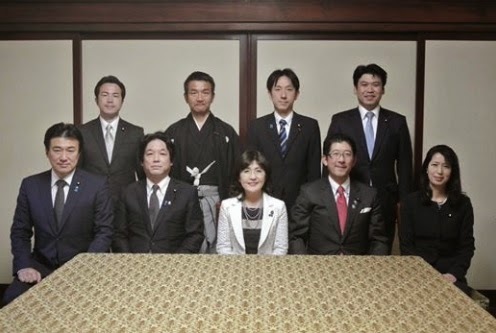 On Monday, the 62nd anniversary of the end of Allied Occupation of the Japan main islands, State Minister for Administrative Reform Inada Tomomi paid her first visit of the year to Yasukuni Shrine, accompanied by eight members of her Tradition and Innovation Association (pictured). After their visit, Inada and her associates had nothing else to do. There seems to have not even been a repeat of the private loony fest (Link) in the afternoon either. Somehow, somewhere the national day of remembrance worthy of not just a speech but indeed an oration (Link) was not worthy of even a hip, hip hurrah. Photo courtesy: Inada Tomomi Facebook page. However, in the the bleak emptiness of what was once a crowded port area, the pathos of the start of Ayukawa's 2014 research whaling season could not be missed. As a surfeit of helmeted public security forces putt-putted around in the tiny harbor, disorganized ranks of hunters, their feeble numbers boosted by platooned female office staff members in uniform, pledged to fight to keep Japan's whaling traditions alive. The 18 April 2014 Ministry of Agriculture, Forestry and Fisheries handout makes clear, Japan's ambitions as regards a revival of commercial whaling are modest and growing ever more so. In the aftermath of the International Court of Justice's invalidation of the Southern Ocean pelagic research whaling program (JARPA II), the Ministry hopes to submit a new Southern Ocean research whaling plan to the International Whaling Commission's scientific committee next year, with MAFF offering no projection of a desired date for an actual resumption of JARPA permit whaling. The start of the coastal portion of JARPN II 2014 was delayed for four days. According to new reports the cause of the delay was the implementation of measures responding to the ICJ's ruling. However, a wish to delay the opening of the season until after U.S. President Barack Obama was well outside the country might also have played a part in the decision. Hayashi Yoshimasa, you do eat right (Link) but where is thy ambition? Why do you not adhere to the tradition of obdurate stupidity of the great MAFF minister of old? Screen shot of first Minke whale taken in 2014 coastal research whaling hunt courtesy NHK. Lesley Clark of McClatchy News has done a terrible thing: she has reported my views accurately and succintly. "World War II Complicates Obama's Trip to Asia"
Talk about a tiny basket of ideas that manages to offend just about everybody. Member of the House of Councillors for Tottori Prefecture, Ph.D (George Washington University, wrote his dissertation on the conversion of the Soviet military-industrial complex to civilian production), member of the New Renaissance Party and Group of Independents Caucus (current membership = 3), former staffer for both the Center for Strategic and International Studies (CSIS) and the Congressional Research Service (CRS) Hamada Kazuyuki (Link) seems to be his own brand of nuts. ..in some quarters, Mr. Obama is derided as "the worst president of the postwar era." Of the many, the biggest reason for the collapse of [Barack Obama's] reputation is his bad relationship with his wife. It is an open secret that the pair are already in negotiations for a divorce and that "they are waiting for his term in office to end, at which point they will separate." If you ask the President, he will tell you, "I cannot show my face to the voters after her spendthrift ways." 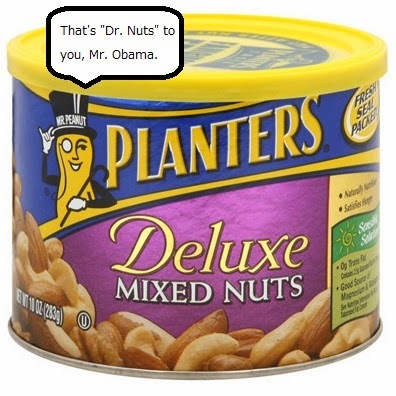 On the other hand, if you get Mrs. [Obama] to speak, she will tell you, "The President is a pathological philanderer. He uses the Secret Service in this regard and has them cover up the evidence." My assumption: Hamada Kazuyuki is not on the list of invitees to the State Dinner tomorrow night. If he is, he shouldn't be. Another assumption: Hamada is not sought out by his former Washington colleagues as a valued source of insight into the politics in this blessed land. And to think I thought Fujita Yukihisa's 9/11 conspiracy theories painful to read...which they were, as Fujita was one of the few members of the Diet willing to criticize Japan's pre-1945 record of imperial expansion and human trafficking. Two folks I like a lot, whom I am on good terms with, and who might as well be on separate planets, writing about this week's visit by President Barack Obama. The really fun part of the exercise? Knowing which one is the ex-diplomat. Nota Bene - Harner knows I really disagree with his assessment of Robert Kelly's essay for The Diplomat. Bewildering and ominous is the report that Minister of Internal Affairs and Communications Shindo Yoshitaka made a repeat visit this morning as well (Link - J). Shindo visited the shrine on April 12, before the start of the Spring Festival, just as he had done last year. Just why he thought it wise or necessary to visit the Yasukuni again and so close to the visit by President Barack Obama. Source: Clay's Flickr photostream, under a Creative Commons License. 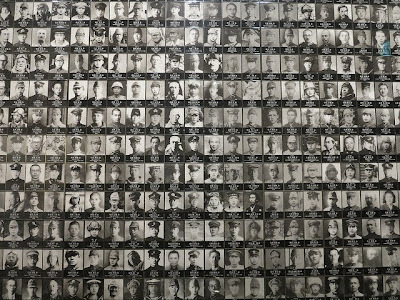 Instead getting all the visits of those who are just hell bent to pay some sort of tribute to Japan's loyally self-sacrificing imperial subjects out of the way before President Obama's plane touches down is supposed to be as a concession of sorts to the United States. 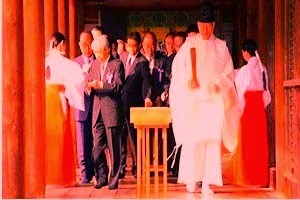 b) any Liberal Democratic Party member of the Diet shows up at Yasukuni during the Obama visit. Aso has been keeping his head down ever since his infamous "Is there not something to learn from the overthrow of the Weimar Constitution?" musings of last year (Link) and Inada and Shimomura deferred their visits. If any of these three ministers pops up in Kudanshita any time between now and Wednesday noon -- then we should not be surprised to see fireworks -- which in this blessed land are usually a summer phenomenon. Incidentally, I recently visited the attached Yushukan (Link). I had long eschewed going, not wishing to give a yen to the shrine or its affiliates. However, when a certain officer of the Congressional Research Service asked if I were available to tag along on a visit, I broke my longstanding vow. If the goal of the Yushukan is to fill one with a sense of awe or sadness, it fails. What even the mildly questioning mind comes away with is a sense of the essential and obvious stupidity of the Japanese imperial enterprise. The section of the museum on the build up to the Pacific War, with the focus on Japan's resources crisis in the face of U.S. embargoes, is a window into the fear Japanese conservatives have about energy, particularly nuclear energy and the nuclear fuel cycle. Looking at the exhibits at the Yushukan it is not surprising that the present generation -- who have never known anything but abundance -- are nevertheless paranoid about Japan ever being pushed into making a strategic choice out of a want of raw materials. Yesterday morning I was seated in the far left side of the Ascot banquet hall of the Hotel Okura. From out of the dark on the far right, avoiding a piece of equipment dropped in his path (the special police had something to say about that afterward) walked in Abe Shinzo, the prime minister of Japan. Or at least that is what my eyes, my program and everyone around me was telling me. The man delivered a set speech for fourteen minutes and fifteen seconds, then sat down in an armchair answering questions from the chairman of the day's proceedings for another ten and a half minutes. I have had Abe Shinzo in my line of sight since October 2005, when I attended a conference on Japan's defense at the hotel nearest the Kantei. Abe, the then Chief Cabinet Secretary, was the keynote mealtime speaker. The speech then was unimpressive. The phrase best describing its delivery: "still wet behind the ears." Halfway through Abe seemed to lose himself, using the expression ware-ware ("we" "us") to explain what his grandfather Kishi Nobusuke was doing during the build up toward the signing of the revised Security Arrangements between Japan and the United States. I turned to my tablemate (Dr. Richard Samuels of MIT) with a look on my face of "Did Abe Shinzo just refer to himself as a comrade-in-arms of his grandfather during the Ampo struggle, when he was all of six years old?" That man, the Abe Shinzo I know, or thought I knew, did not show up at the Japan Summit 2014. The person called Abe Shinzo at the dais and in the armchair yesterday was not Abe Shinzo, grandson of Prime Minister Kishi Nobusuke, grandnephew of Prime Minister (and Nobel Peace Prize winner) Sato Eisaku. He was Abe Shinzo, Prime Minister of Japan, President of the Liberal Democratic Party -- pure and simple. When he sat down in the armchair to answer the hard ball questions thrown at him by The Economist's Asia chief Dominic Ziegler, throwing them right back at his interrogator when when answering was not in his interests ("Since what you are asking pertains to what tactics my country will be using [at the Trans Pacific Partnership negotiations] I obviously cannot provide details") -- Abe owned that chair like I have never seen any Prime Minister of Japan own a piece of furniture. Not quite a Vladimir Putin slouch -- but Abe still sat in that chair as if he had brought it with him from home. This was not your "wet behind the ears" botchan, acting out the role of prime minister with the shadow of imposture looming over him. Those who still look at Abe Shinzo that way are living in the past -- and it might as well be the distant past. Was Abe's astonishing poise, humor and self-confidence all an act? Maybe. But then he and his handlers should be triply congratulated for having him put on this act in front of not just the domestic and international news media but an overflow crowd of the world's investment community -- at a time when Abenomics in need of a PR boost...and furthermore on the eve of an incredibly important official visit by U.S. president Barack Obama. If the Abe Shinzo who showed up yesterday meets an Obama delegation believing that he has to ingratiate himself to them, then the Americans are going of find out what the phrase "hitting a brick wall" means. Failure at the final push for a TPP agreement this weekend? Abe Shinzo will not give a damn -- and nobody around him will either. Abe's Cabinet is enjoying an insane 60% support rating (latest Kyodo News poll). His party holds the commanding heights in the Diet, the policy debate and the public's imagination. The number of persons answering the question of "Why do you support Prime Minister Abe?" with the plaintive and honest, "Because there is no other suitable person around" is climbing. "Because there is no other suitable person around" is indeed now the most common answer to the question of why voters support the PM, outdistancing the "high expectations for the economy" response (29% of respondents versus 21% again in the latest Kyodo poll). Abe Shinzo 2.0, Spring Edition is so comfortable in his own skin he is even letting his beloved hair go, allowing the gray to show. Partial reproduction of photo image of 15 April 2014 "blood moon" by professional photographer Jeff Cable. Click here for the original image and here to read the explanation of how it was created. 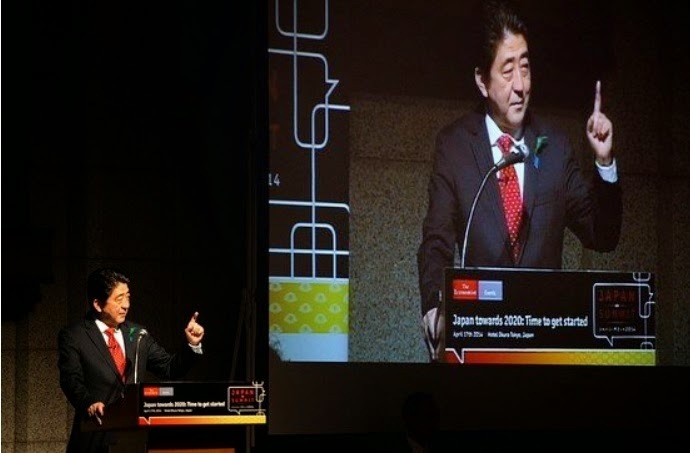 Photo image of Abe speaking at the Japan Summit 2014 courtesy JapanRealTime. In a post on March 27 I suggested a new word --"dumbwalking" -- to describe the glacial and autistic walk of persons absorbed in interaction with their smart phones ("Smart Phones Make For Dumb Walks" being my explanatory epigram). I suggested at the time that the proliferation of smart phones would bring on the day when the Shibuya Crossing would fail to clear. 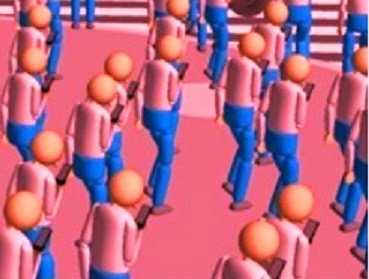 The result: if the crowd of walkers are all operating smart phones, only 36% of them make it across in the 46 seconds they have between the light changes at the Shibuya Crossing. Click on the link and watch the video. It is trip -- literally, in some cases. One key variable, made clear at the 0:47 point of the simulation, is the speed at which dumbwalkers are presumed to perambulate. 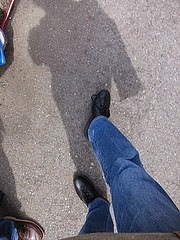 According to motion studies at the Aichi University of Technology, dumbwalking (the Japanese term is sumaho aruki) is an astonishing 20 times slower than normal walking. So "glacial" is not hyperbole and one is not imagining things. Dumbwalkers really are moving so slowly they might as well be considered inanimate objects. Takes the "mobile" right out of mobile telephony, doesn't it? I suppose I should not try to double-guess Tokyo Metropolitan District Governor Masuzoe Yo'ichi. He did, after all, navigate through rough political waters to victory in February. However, I must confess puzzlement at Masuzoe's willingness to be used as a ratings prop by news organizations. He is supposed to be running the world's richest and most populous municipality. How can he have time to sit helpless in TV studios doing nothing as producers run 4 minutes long features and as snide and chirpy hosts bypass the governor to elicit comments from other guests of decidedly minor stature, meaning that their utterances will be remarkable not only their dearth of knowledge but their lack of significance and/or relevance. 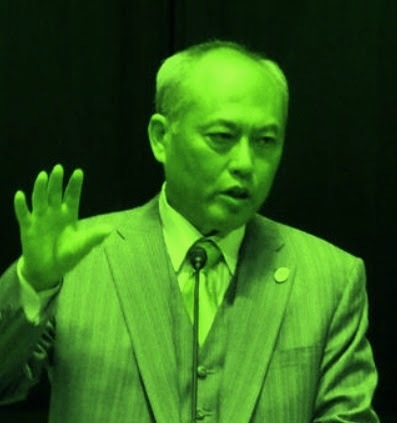 Seeing Masuzoe imprisoned in chair on the Nihon Terebi (Yomiuri Shimbun Group) Saturday and Fuji TV (Fuji Sankei Group) Sunday morning shows had me asking, over and over again, "What is he doing there? Is he afraid that if we do not see him continuing his ring-around-the-talk shows tours, we will forget who is Tokyo's governor? Or is he merely trying to feed the media beast pre-emptively so that when crunch time comes, the conservative media conglomerates do not bite him?" For any and all politicians, Fuji TV's Sunday morning show is a particular ordeal. The announcers and other guests just toss bait -- annoyances, insults or irrelevant nonsense -- at the main guest trying to get him or her to create a scandal by a provocative or merely poorly thought out response. Than again, Masuzoe seems to need no prompting to toss sharp and not entirely well thought out remarks on his own. 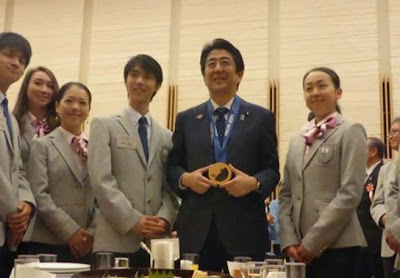 On Saturday he dismissed of the Akasaka Detached Palace where the Government of Japan houses and receives its most honored guests as "a sham Versailles" unworthy and unrepresentative of Japan (Link - J). His longing for a "more Japanese" building fror housing honored guests begs the question, "OK, Monsieur Pantalons-Astucieux," -- Masuzoe is a Francophone and has taught in Paris -- "where in the budget of either the GOJ or the TMG is there the money to pay for a substitute?" It would make zero sense to have SM-3 equipped Aegis vessels sailing the oceans without authorization to shoot down ballistic missiles threatening Japan. When seconds separate possible intercept and a pointless miss, the system cannot possibly rely on a call the Prime Minister's Residence and/or the Defense Minister to receive authorization. So if authorization is standard, what has Onodera done? 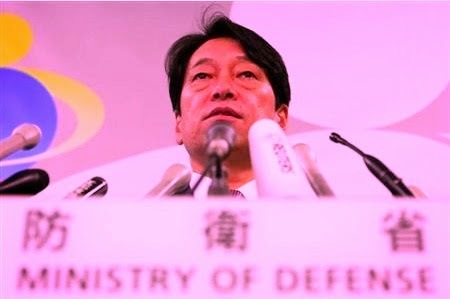 According to The Asahi Shimbun, Onodera ordered the MSDF Kirishima (Photo) to sea on a training mission lasting from April 3 to April 25 -- a training mission where the captain has been given special authorization to engage in anti-missile combat activities, if he thinks circumstances merit them (Link). Had he addressed the crew before departure, Onodera's message would have been, "Sailors and officers of the Kirishima, no 'defense of Japan' stuff while you are out there -- unless. of course, it's absolutely necessary. Bon Voyage." For those keeping score, yet another instance of extraordinary casuistry deployed by Japanese security officials in the course of conducting their daily tasks. Later - On Twitter Andrea Ortolani writes that the ship-to-shore communications mentioned above would like be via fax, not voice.